Caleb is a 2001 graduate from North Branch High School in North Branch, Lapeer County, MI. He attended college with the hopes of becoming an engineer. At the time of Caleb’s disappearance he was an intern at Metamora Products. 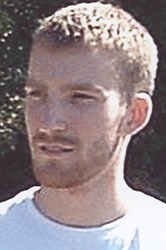 Caleb was last seen at his home in North Branch on May 30, 2005. His maroon, 1996, Buick LeSabre was later found abandoned in the Lapeer State Game area with his personal belongings, identification, and a box of bullets inside. A gun registered to him is missing. Caleb may need assistance because of an unnamed medical condition. Posted on Wednesday, February 11th, 2009 at 8:32 pm. Last updated on Wednesday, January 6th, 2010 at 12:33 pm.